Generally speaking, I often prefer the bold, rustic taste of American bourbons to Irish, Scottish, or Canadian whiskies. I suspect many of you have the same preference. But, taking a small step outside my comfort zone, I decided to check out the affordable Reserve 10 Year Old from our neighbor to the north. Poking around on Canadian Club’s video-intensive website, I was surprised to learn that this 150-year-old company isn’t as foreign as its name might suggest. It was founded in 1858 by an American, Hiram Walker. Fearing the temperance movement in his home country, which ultimately culminated in an ill-fated 13-year criminalization of alcohol, Walker built a distillery across the Detroit River in Ontario, Canada. From there he exported his popular “Club Whiskey” to high-end bars, restaurants, and golf courses around the world. Any company this old is bound to have some history, and Canadian Club is no exception. Legend has it that Winston Churchill’s future mother, visiting New York in the 1870s, requested a cocktail consisting of Club Whiskey and sweet vermouth—inadvertently inventing the first Manhattan. And Canadian Club helped fuel Prohibition-era speakeasies in the U.S. by dealing directly with Chicago gangster Al Capone. Today, Canadian club’s whiskies, including the Classic 12 Year Old, are sold in over 150 countries globally. They are made from a combination of corn, rye, rye malt, and barley malt that’s uniquely blended before aging to enhance the marriage of flavors. The Reserve 10 Year Old is aged in once-used white oak. These American bourbon barrels were chosen because, by the time they are used by Canadian Club, they’ve lost their aggressive oak profile—making them well-suited for a mellow spirit. So it isn’t surprising that the nose is bit tough to pick up, especially for a whiskey. But, after a low viscosity pour, careful attention yields elusive aromas of smoke, butterscotch, honey, and citrus. The bright and crisp taste includes oak, vanilla, corn, and toffee. And while the finish is impressively long and warm, the overall effect is nonetheless soft and slightly dry. Most will enjoy the Reserve 10 Year Old neat or on the rocks—especially for a whiskey that sells for $15-18 per 750 ml. bottle (80 proof). Those of you who are more accustomed to hearty bourbon flavors, though, may find it approachable yet too mellow on its own. So try it in a highball, old fashioned, whiskey sour, Manhattan, or with a splash of Coke. 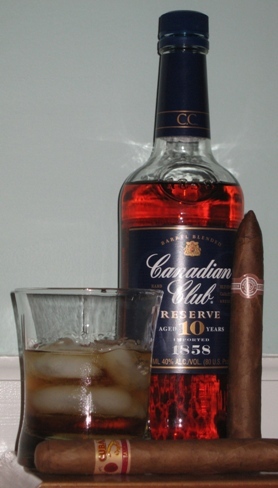 The success of various cigar pairings will likely depend on your cocktail of choice. But, in its most straightforward form, I can recommend medium-bodied smokes like the Montecristo No. 2, Cuban Crafters Cubano Claro, PG 15th Anniversary, and the La Aurora Barrel Aged. It’s no surprise that bartenders to this day associate CC, Crown Royal, and others as handy substitutes for straight rye whiskey, which was the spirit of choice in pre-prohibition America.